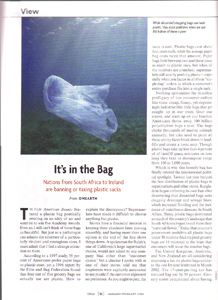 Nations from South Africa to Ireland are banning or taxing plastic sacks. The film American Beauty, which features a long, poetic clip of a plastic bag swirling on an eddy of air, snagged five Academy Awards, yet I for one still find it hard to think of plastic bags as things of beauty. But as a product — as something created and then unleashed to become seamlessly integrated into the lives of millions of people around the world — there is a strange allure to them, just as a pathologist can admire the structure of a particularly virulent and contagious virus. According to a 1997 study, 58 percent of Americans prefer paper bags to plastic ones; yet a 1996 report by the Film and Bag Federation found that four out of five grocery bags we actually use are plastic. How to explain the discrepancy? Supermarkets have made it difficult to choose anything but plastic. Stores have a financial interest in keeping their checkout lines moving smoothly, and having more than one option at the end of the line slows things down. A spokesman for Ralph's, one of California's large supermarket chains, would not admit to any company bias other than 'customer choice,' but a checker I spoke with at one of their stores told me that employees were explicitly instructed to use plastic if the customer expressed no preference. As you might expect, the issue is cost. Plastic bags cost about four cents each, while the average paper bag costs twice that amount. Paper bags hold between two and three times as much as plastic ones, but when all the numbers are crunched, supermarkets still save by pushing plastic — especially when you factor in all those 'single-bag' orders in which a customer's entire purchase fits into a single sack. Nothing epitomizes the mindless profligacy of our consumer culture like these cheap, flimsy, yet depressingly indestructible little bags that get caught up in our trees, litter our streets, and wash up on our beaches. Americans throw away 100 billion polyethylene bags a year. The bags choke thousands of marine animals annually; the inks used to print all those smiley faces break down in landfills and create a toxic seep. Though plastic bags take up less than 4 percent of all landfill space, estimates on how long they take to decompose range from 100 to 1,000 years. Which is why this homely bag has finally entered the international political spotlight. Taiwan last year banned the free distribution of plastic bags in supermarkets and other stores. Bangla-desh began enforcing its own ban after discovering that discarded bags were clogging drainage and sewage lines, which increased flooding and the incidence of waterborne diseases. In South Africa, flimsy plastic bags dominated so much of the country's landscape that South Africans began to call them their 'national flower.' Today that country's government prohibits all plastic bags under 30 microns thick (typical grocery bags are 18 microns) in the hope that customers will reuse the sturdier bags. Excerpted from OnEarth (Summer 2003), an environmental magazine that keeps one eye on the nation's natural treasures and the other on certain lawmakers with a kleptomaniac's compulsion to loot them. Recent issues have featured stories on big-picture issues like energy policy and ocean life off Maine, plus reviews and profiles. Founded as The Amicus Journal in 1979 and renamed in 2001, OnEarth is published quarterly by the Natural Resources Defense Council.